Pope Francis on Thursday announced June 8 as the date for President Shimon Peres and Palestinian Authority (PA) Chairman Mahmoud Abbas to "pray for peace" at the Vatican. While in PA-held Bethlehem on Sunday, where he called the PA the "state of Palestine," the pope extended an invitation to the two "to join me in heartfelt prayer to G-d for the gift of peace." In the Vatican statement, it was detailed that the "prayer" meeting "will take place on June 8, during the afternoon," a date "accepted by both parties." The meeting has been scheduled at short notice so as to take place before the end of July, when 90-year-old Peres will step down from his largely ceremonial post of president. During his return flight from Israel, the pope said "the meeting in the Vatican is to pray together, it's not a mediation. It is a prayer without discussions." The pope sparked controversy during his "apolitical" visit when he made an impromptu stop at the security barrier between Bethlehem and Jerusalem, built to stop terror attacks. He got out and prayed at the wall, right by a section with a spray-painted text that said "Pope we need to see someone to speak about justice. Bethlehem look (sic) like Warsaw ghetto. Free Palestine." Earlier this month, Peres claimed on Israeli television that Prime Minister Binyamin Netanyahu had blocked a peace agreement he had secretly negotiated in Jordan with Abbas in 2011. The prime minister denied the claims. 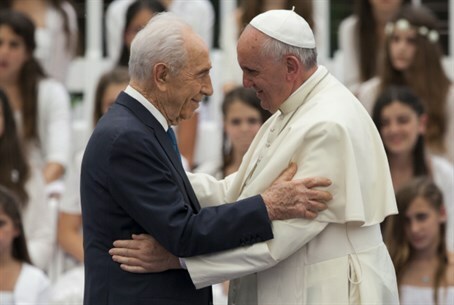 During the pope's visit Peres addressed him, saying "the values which you stand for enrich us and bring righteousness between people." Not everyone in Israel is as enthralled with the pope however; Rabbi Yonatan Shtenzel told Arutz Sheva on Wednesday that the pope knows where Jewish vessels and treasures from the Second Temple are kept in the Vatican, but is hiding them in an act of "diplomatic evasion."